The trick to brightening your room with silk flowers is to make careful choices of colors and styles and select the proper container. Silk flowers can make for a beautiful centerpiece or home accent, but some arrangements look garish and obviously fake. Look to nature when choosing colors, blooms and greenery for a realistic arrangement. Consider overall color of arrangement. Silk flowers can complement a room's decor, but shouldn't match it exactly. Unless it's a common color like yellow or white, flowers that are identical in shade to the walls or drapes will be a signal that the arrangement is fake. Select a mix of colors. Think of the live flower bouquets you see in grocery stores, with the beautiful mix of colors and textures. Choose three or four colors and buy multiple stems within that color family. Simple and muted colors look the most realistic. Stay away from shocking pinks, bright oranges and turquoise. Choose flowers with dark or muted color leaves and stems. Try to find leaves with variations in shades and size. Branches with uniformly bright green, shiny leaves are obviously fake. Choose clusters of small flowers and wild flower varieties. The temptation to choose large, dramatic flowers can be strong, but if you want your arrangement to look realistic, smaller blooms are the best choice. Select a variety of shapes and textures. You can keep them on the same size scale, but choose some long, narrow clusters, shorter and round clusters, and some single flower pieces. Visualize live floral arrangements, with their clusters of baby's breath and ferns. Selecting the right filler is a crucial part of making your silk flower arrangement realistic. Choose muted and or variegated colors for your greenery. You want this to be a backdrop for your flowers, not the centerpiece. Fern and needle type evergreen silk greenery often looks the most realistic. Add a few pieces of wide greenery to fan out on either side of the arrangement. Choose floral and greenery stems of similar scale. Length can be adjusted somewhat, but 4-foot long stems are not going to be compatible with smaller, 20-inch pieces. Choose an opaque or solid vase. Clear glass or plastic containers reveal the plastic stems and lack of water. A solid, textured vase hides the puppet strings, so to speak, so your flower arrangement looks real. Use a container other than a vase to add to the "just picked from the garden" feel of your arrangement. Ceramic pitchers, cookie jars or metal tins work nicely. Experiment with containers you find around your kitchen. Choose a vase that's the right scale. Flowers should fit snugly into the container. Flowers can spill over but shouldn't overwhelm the vase, and the vase should never be so large that some of the flowers are hidden from view. Spread silk flowers you've chosen on the worktable, leaving open space in front of you. Remove any store tags from stems. The arrangement should have depth, with different levels and the shortest flowers hovering around the rim of the vase. Select the tallest pieces that will make the back of the spray and set them on the table in front of you. Select the pieces that will form the middle level of the arrangement. Choose the denser clusters of flowers, as this will make up the bulk of the arrangement. Grasp arrangement by the stems and hold it upright, keeping it in the same formation you laid it out in. Add the greenery around the back and sides. Use denser pieces to help fill out the back, and add wide spray pieces at the sides. When arrangement is satisfactory, carefully hold it next to the vase you plan to put them in. 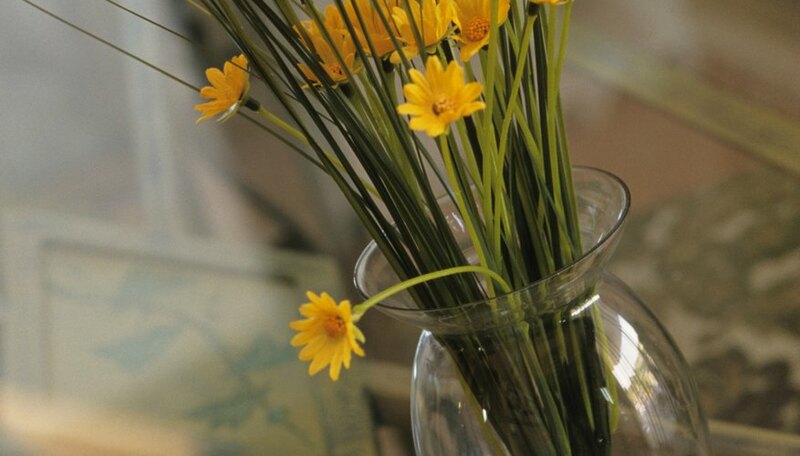 The stems should all be hidden inside the vase, so make note of how much they extend beyond the length of the container. Carefully lay arrangement back down on table, holding the stems in their current position. Use the floral wire cutters to cut the stems at the bottom. You want the arrangement to sit in the vase exactly the way you've arranged it, so the ends of the stems should be in an even line when you're done. When stems are all cut, lift arrangement and place in vase. Don't worry if it's not in a precise shape. The arrangement will look more natural with uneven heights and a somewhat unbalanced selection of flowers. Wind some of the flowers and leaves together so it's a more cohesive blend. Make the spray dense and varied. When arranging, think about how a cluster of wild flowers from a field or from your garden would look if gathered up and dropped into a vase. Make the arrangement as organic as possible, but not too messy or lopsided. If the flower arrangement will be in the center of a table and viewed from all sides, keep the tall flowers in the center, and intermingle the greenery and smaller flowers in decreasing levels all around the perimeter. Large vases require a lot of flowers, which can get expensive. Buy a dense cluster or two of plastic greenery to help fill out the arrangement. It adds to the natural look and helps keep the floral arrangement in place. Bend the wire stems at the end to get them to the right length instead of cutting them so the stems can be reused. If the vase seems unsteady, place small stones or decorative glass marbles in the bottom to help weigh it down. Make sure that the vase is sturdy enough to support the arrangement, especially if it is a breakable piece. Top-heavy arrangements might have a tendency to tip in a lightweight or narrow vase. Be careful when cutting the wire stems. The wire edges can be sharp when exposed from the plastic coatings.